"[Presidential candidates] Senator Barack Obama, Governor Bill Richardson, Senator Hillary Clinton and [Mrs.] Ruth Harkin stand during the national anthem." Have a look at thise photo from the October 1, 2007 edition of "Time." It shows Obonzo, Hillary and Bill Richardson at the Steak Fry of Sen. Tom Harkin (D-Iowa) on September 16th, 2009, in Indianola, Iowa, a small farming town south of Des Moines, during playing of the Stars & Stripes, our National Anthem. But not Obonzo, the only candidate that refused to 'salute' the flag, and who instead struck a laughably described 'fig leaf pose' during the National Anthem. Does he perhaps believe that, like wearing an American Flag lapel pin (Obonzo refused to wear that, also), the 'hand over the heart' act isn't "true patriotism"? Well, duh. Obonzo perpetrates this arrogant lack of action because in true and legal fact, he does not mean it: foreigners have no such "duty." Obonzo proves he is not a "natural born Citizen," i.e., some human being literally born in the U.S.A., as it is required in the Constitution for the United States of America, in Article II., Section 1, Clause 5; and all lack of proof from anyone to the contrary has yet to be conclusively demonstrated. Other sites may suggest this was a distortion of the truth; but Obonzo has "flipped off" so many other aspects of political and presidential necessities that this is more believable than any suggestions to the contrary. At a military function elsewhere, OBonzo refused to come out to address the troops when the "ruffles and flourishes" were played ny the military band to announce his arrival, as it is usually played. The band played it several times, and got no Obama each time. A direct snub, and it was reported that way, too. ("What are "ruffles and flourishes"? A ruffle is played by a drum, a flourish by a bugle. Like this: DUM da da DUM da da DA-A-AH!" Maybe twice; you'll know it when you hear it again, assuming Obonzo acquiesces to its use. At least, that's what I found! And den', da Pez-de-dendt he caumes eain 'n sez somm-tin no buddy bee leaves 'n den he git). 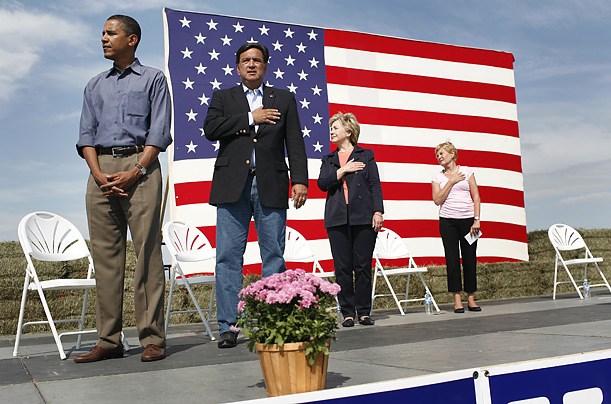 All this plainly indicates that Barak Obama, Obonzo, here, is not a Citizen of one of the several States that are included the Union of the United States of America, and, having no such duty as we do, he demonstrates this every time he can, whether it be dis'ing the National Anthem, or refusing to 'salute' the Flag of the United States of America, or dis'ing the military, or any other way to prove his actual "place & personage." See also the other Obonzo Image, about "Obama not saluting or putting hand over heart at Veterans Day memorial," where he refuses to "salute" the National Anthem, by not 'covering his heart' as the rest of us do at that moment. "Patriotic"? No, he isn't. And there is no necessity for him to be such, either. (*Or do we only do that for the "pledge of allegience"?). Think on this.